PHOTO BY JONATHON BIRD Tiffin University’s Jensen Hiegel takes a shot over the reach of Wayne State’s Payton Birchmeier during the first half Saturday. The Tiffin women’s basketball team battled back-and-forth with Great Lakes Intercollegiate Athletic Conference foe Wayne State Saturday, but a 21-10 run in the third gave the Warriors a 66-59 victory. The game started with a steady offensive pace by both teams with Wayne State (14-5, 9-4) taking an 18-15 lead at the first stop. Tiffin held the Warriors to 13 points in the second, while pouring in 15 to cut the halftime deficit to 31-30. The Dragons sank better than 46 percent of their first half shots and hit 4 of 13 triples. 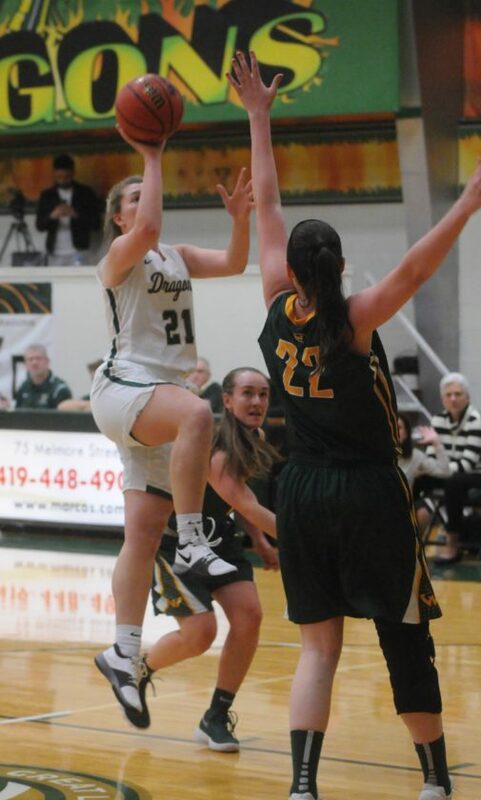 Tiffin (7-14, 3-10) held the Warriors to 2 of 7 from beyond the arc and held a 17-16 rebounding edge. Wayne State stomped on the gas in the third sinking 21 points, while Tiffin fell into a cold spell netting only 10 points. The Warriors held a 51-40 lead going into the final quarter. Tiffin gave all it could in the fourth to close the gap. In the final 37 seconds, the Dragons managed to close the gap to five points, but were unable to climb out of the hole. Ali Schirmer led the Dragons with 17 points followed by Aida Santana Martin with nine points and six rebounds. Jensen Hiegel led TU in rebounding with seven boards, while Madison Jackson had a team-high four assists. Nastassja Chambers led the Warriors with a game-high 18 points to lead three others in double digits. Alex Matus tossed in 16 points followed by Ja’Nae Williams (11) and Shannon Wilson (10). Williams and Wilson each had a double-double each grabbing 10 boards. MARIETTA — The Heidelberg women’s basketball team continued to struggle shooting the ball and turned the ball over 19 times in a 98-64 loss to No. 23 Marietta Saturday in Ohio Athletic Conference action. About midway through the first quarter, Brittanie Ulmer hit a 3 to put the Student Princes up 7-4. Marietta (18-3, 11-3) closed out the first with a 14-4 run while forcing six ‘Berg turnovers. Heidelberg (4-17, 2-12) fought its way back to take a 27-27 lead in the second. Three straight triples — two coming from Alyssa Riley — helped the Princes cut into the deficit and take the lead. The lead was short lived as the Pioneers took a 42-35 halftime lead. In the final two quarters, Marietta continued to pour on the points, outscoring HU 57-29. Marietta scored 27 points off turnovers. Heidelberg shot just 33 percent from the field. Riley led the Princes with 18 points followed by Aianna Wilson with 12. Ulmer and Seneca East grad Megan Siesel each tossed in 10. Madelyn Crawford only managed four points and a team-high six rebounds — tied with Wilson and Siesel. The Pioneers were led by Brooke Borich’s 21 points. Amisha Herd and Shay Lett each netted 19 points while Laura Pullins tossed in 14. MARIETTA — Heidelberg mens basketball rallied from a 15-point deficit to take home a much needed win in the hunt for a berth in the OAC tournament. The Student Princes picked up an important 71-65 win over No. 22 Marietta — coach Andy Bucheit’s former employer — Saturday. It marked Heidelberg’s third win over a ranked opponent this season. The first came against then-No. 12 North Central on Nov. 18 and the second was against OAC foe and then-No. 24 Baldwin Wallace on Jan. 24. Marietta (16-5, 10-4) held an early 17-8 lead, which forced Bucheit to take a timeout. After the rest, Heidelberg ( 9-12, 5-9) scored the first four points, but the momentum was short-lived. The Pioneers continued to grow their lead and took it to 42-29 at the half. The Princes battled back in the second. The rally started with a 7-0 spurt, which forced Marietta to take a timeout. Down by nine later in the second, Chris Moxley scored seven straight points. At the halfway point, ‘Berg trailed 53-51. With less than three minutes left in the game, James Hanley used a put-back layup to give the Princes a 63-62 lead. A pair of Myron Prewitt free throws and a put-back by Mike Mason extended the lead to four with 2:11 left. With a chance to tie the game, the Pioneers missed a contested shot and Josh Dixon grabbed the board with 47 seconds left. Following a timeout, ‘Berg fed Mason the ball on the block for a bucket. In the final 15 seconds, Marietta’s DeVaughn Wingard missed a pair of treys before Kiere Bennie corralled the rebound. Bennie sealed the win with a pair of makes at the charity stripe. The win snaps a string of 16 losses to the Pioneers dating back to the 2010-11 season. Moxley led the Princes with game-high 19 points while grabbing seven rebounds coming off the bench. Prewitt tossed in 18 points and five boards while Mason netted 14 points and also had seven boards from the bench. The Pioneers were led by Kyle Dixon’s 16 points followed by Wingard (12), Caleb Hoyng (11) and Dillon Young (10). Tiffin’s mens basketball faced a GLIAC setback Saturday with a 71-68 overtime loss to Wayne State. The Dragons led by as much as 12 points in the second half, but the Warriors bounced back to mount a comeback and take the win. The game opened with a 17-7 run by Tiffin (7-14, 3-10) with the help of a Quentin Jones jumper with 12:33 left in the first half. Wayne State (10-8, 8-5) slowly chipped at the deficit and managed to pull even at 21 apiece. The Warriors used a 14-4 run over the course of 10 minutes to knot the game up. Austin Adams made a pair of free throws to tie the game at 23 as both teams went into the break deadlocked. The Dragons came out of the break spitting fire. TU used a 16-4 run to take a 39-27 lead. The Warriors stood their ground and responded with a 20-9 run to pull with in 48-47. Alex Brown hit a jumper at the 3:20 mark to extend TU’s lead to 53-47. Wayne State countered each Tiffin bucket with one of its own. Over the span of the last three minutes of regulation, the Warriors outscored the Dragons 8-2 to send the game to overtime tied at 55. Wayne State used a 7-0 run to take a 62-55 lead with 2:04 remaining in OT. Tiffin battled back to cut the deficit to 68-66 with 21 seconds left. Free throws down the stretch were clutch for the Warriors as they hit 8 of 9 to drop Tiffin. Adams led the Dragons with a double-double scoring 21 points and grabbing 12 rebounds — both game highs. Shane Waldon backed him with 14 points and seven boards followed by Terrell Mabins’ 13 points and Justin Miller with 12. The Warriors were led by Marcus Moore’s 20 points followed by Ronald Booth (16), George Spencer (14) and Chuck Key (12). BOWLING GREEN — With about two minutes left in the game, a pair of 3-pointers helped Miami earn a 66-62 win over Bowling Green Saturday in Mid-American Conference action. Bellevue graduate Carley Santoro tied the game at 58 with a pair of free throws before Miami’s Leah Purvis hit her first triple in the late going to give the RedHawks a 61-58 edge. A pair of BG layups coming from Caterrion Thompson and Angela Perry put the Falcons up by one with 1:23 left to play. After a brief break, Purvis sank her second trey with 51 second left to take a 64-62 lead. Lauren Dickerson sank a pair of free throws to seal the win for Miami. Santoro scored 14 points in the loss while grabbing a team-high seven rebounds. Thompson and Haley Puk also each scored 14 points for the Falcons.